Yellow RSL19:Racing - Pagid's classic compound for endurance racing on the basis of the RS 14. A slight reduction of the friction value improves the modulation (controllability). Constant temperatures up to 600C (1.100F) are possible. The combination of friction value, fading stability and low wear rateson pads and discs (rotors) realized with this pad compound is unmatched up to now. Due to its outstanding wear rate and driveability, PAGID endurancematerials are often used at sprint races. A multiple winner of Daytona 24h, Le Mans 24h, Sebring 12h, Spa 24 h, Nurburgring 24h, often with no pad change and usually no disc (rotor) change. Since Pagid pads tend to "out-gas" we recommend using these pads with a new gas-slotted or cross-drilled rotor for the best performance. 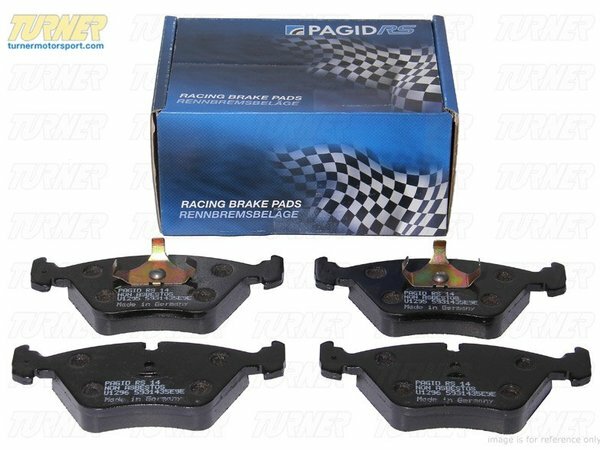 Pagid brakepads are not compatible with previously used rotors, especially if used with a carbon or Kevlar based race pad. Yellow RSL19: Racing - Pagid's classic compound for endurance racing on the basis of the RS 14. A slight reduction of the friction value improves the modulation (controllability). Constant temperatures up to 600C (1.100F) are possible. The combination of friction value, fading stability and low wear rateson pads and discs (rotors) realized with this pad compound is unmatched up to now. Due to its outstanding wear rate and driveability, PAGID endurancematerials are often used at sprint races. A multiple winner of Daytona 24h, Le Mans 24h, Sebring 12h, Spa 24 h, Nurburgring 24h, often with no pad change and usually no disc (rotor) change.